(Fortune) -- Whose side is Treasury on, anyway? A new report from a federal bailout watchdog reveals that a top Treasury official told executives at Morgan Stanley (MS, Fortune 500) how much it would cost the giant bank to repurchase the warrants it issued to the government following its October 2008 rescue. Did Herb Allison unwittingly hand Morgan Stanley $375 million? Herb Allison, an assistant Treasury secretary in charge of the Troubled Asset Relief Program, apparently provided the number as Treasury was squeezing Morgan Stanley to pay more after a series of lowball bids. Yet Allison may have unwittingly cost taxpayers some $375 million, says a finance professor who has been tracking the government bailout. Linus Wilson, an assistant professor at the University of Louisiana at Lafayette says regulators vastly underestimated the price the Morgan Stanley warrants would have fetched at auction. "It seems that the millionaires' club at the U.S. Treasury put investment bankers' interests ahead of taxpayers," said Wilson, who predicted Treasury would reap billion-dollar warrant paydays at Bank of America (BAC, Fortune 500) and other big banks. "They shouldn't be sharing prices. You certainly wouldn't do this when you were selling your car." Tuesday's report from the Special Inspector General for TARP, or SigTARP, says Treasury "has generally succeeded" in recouping adequate compensation from the banks. The government had raised $5.6 billion in these transactions through mid-March, SigTARP said. But the report criticizes the government for failing to fully document "important parts of the negotiation process" used to set a price on the warrants. It also warns that Treasury hasn't set strict controls on the negotiations -- particularly regarding the sharing of information with the banks Treasury is dealing with. Those flaws were fully on display last summer after Morgan Stanley repaid the $10 billion it got from Treasury in the dark days of October 2008. Once the company repaid its TARP loan, it had the option of repurchasing the warrants it had given the government to mitigate the taxpayers' bailout costs, or allowing the government to sell them into the market in an auction. Warrants give the holder the right to buy shares at a certain price within a certain period, in this case 10 years. According to Tuesday's SigTARP report, Morgan Stanley opened the negotiations in June by offering the government $500 million. After discussions, Morgan Stanley re-bid $500 million in July and was rejected, then bid $800 million and was turned down a third time. In the first week of August, Morgan Stanley raised its offer to $900 million. The TARP warrant committee -- made up of four Treasury officials -- was prepared to accept this bid, SigTARP said. But Allison spoke with Morgan Stanley -- it isn't clear who called whom -- and "communicated that Morgan Stanley would have to bid more to avert the auction process," the SigTARP report said. Morgan Stanley subsequently raised its offer to $950 million, which Treasury accepted. Treasury's internal estimates put the value of the Morgan Stanley warrants at $900 million. 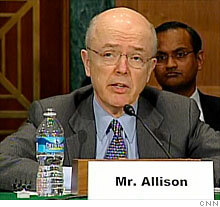 So Allison, in insisting on a higher price, seems to have believed he was protecting taxpayers' interests. He had testified to that effect two weeks earlier in Congress. "Treasury is committed to getting fair value for the taxpayers for these warrants," Allison told a House Financial Services subcommittee last July. But Wilson said the warrants were actually worth around $1.325 billion, based on the terms of the warrants and the values assigned to similar warrants in recent TARP auctions. He said the fact that the Morgan Stanley warrants were "deep in the money" -- that is, they could be sold for a profit at the time -- gave them value that wasn't recognized by the government. The fact that taxpayers could have gotten much more on their investment in Morgan Stanley is all the more galling, Wilson said, when you consider what desperate straits the bank was in at the time the government put money into the banks. While Goldman Sachs (GS, Fortune 500) was stabilized in late September 2008 by its sale of $5 billion of preferred stock to Berkshire Hathaway (BRKA, Fortune 500) and $5 billion of common shares to the public, panic continued to plague Morgan Stanley. Its shares traded in single digits the week before the government infusion amid fears the bank wouldn't get a promised $9 billion infusion from Mitsubishi of Japan. "No large bank was in greater danger of failing right after the passage of TARP than Morgan Stanley," Wilson said.